A collection of Saint David printable activities for kids. Learn a little about the patron saint of Wales and then enjoy our printable resources. Saint David (known as Dewi Sant in the Welsh language) is the patron saint of Wales. He was a Celtic monk who lived in the 6th Century and was Archbishop of Wales. His influence is shown by the number of churches dedicated to him in Wales. Legend says his mother, St Non, gave birth to him on a Pembrokeshire cliff top during a violent storm. David became a renowned preacher and founded many churches and religious communities - some believe he founded Glastonbury Abbey. St David and his monks followed a simple, austere life. They ploughed the fields by hand, ate no meat and drank no beer. St David’s most famous miracle took place when he was preaching to a large crowd in what is now the village of Llanddewi Brefi. When the large crowds could not see or hear him the ground on which he stood rose up to form a hill. A white dove, sent by God, settled on his shoulder. The white dove became his emblem. St David died on 1st March, now St David’s Day, and was buried at the site of St David’s Cathedral in what is now the city of St David’s. Here's an activity that's ideal for older children learning about Saint David. Can they write a letter to Saint David telling him about Wales today? What can he be proud about? Learn to draw Saint David with our fun printable step by step drawing tutorial. Something different for St David's Day! Choose one of the four printables below to write your S-T-D-A-V-I-D acrostic poem. A little tricky, perhaps? This Saint David cloze worksheet is an interesting way to learn a little more about him. We've provided a number of words to be used to fill in the blanks. 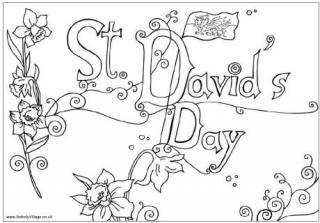 A printable colouring page of Saint David for younger children. Try this worksheet with a difference for St David's day. Can you imagine you're a TV interviewer asking Saint David questions about his life? Write about the life of Saint David as if you're writing a newspaper article with the help of this fun writing prompt. A fun printable poster of Saint David for classroom or home! Use this story paper to write about the life of St David or about your own celebrations for St David's Day. Find out some facts about Saint David, patron saint of Wales, and use them to fill out this fun worksheets. Available in colour or black and white.